Defending champions-Man City dropped their first points of the new season as they drew 1-1 at Wolves in a highly controversial game. Chelsea and Liverpool continued their fine start to the season following narrow victories against Newcastle and Brighton respectively. However, they are not the only ones with a 100% record as Watford also won the third of their first three games, 2-1 at home to Crystal palace in a fiercely contested game on Sunday afternoon. Elsewhere, Arsenal and Fulham grabbed their first victories and points of the season, defeating West Ham United and Burnely respectively. With nine games played so far this game week, as Man United host Spurs on Monday, here are 11 players that stood out for me in game week three. Ben Forster was in Red-hot form as his Watford side maintained their excellent start to the 2018/19 Premier League season, producing two stunning first half saves to set the tone for Sunday’s win. The England international first denied Christian Benteke before saving low from close range, a James McArther shot to ensure that his side goes into half time on level terms. To say that the Hornets are third by mistake would be an undermining statement considering they have a keeper in such outstanding form. On a day that Arsenal somehow won yet they failed to click for 90 minutes, it was their Spanish right-back who produced the much needed inspiration. Hector Bellarin was the architect of two of their three goals and i thought it would be harsh on him missing out in the best eleven of the weekend. What a player he is slowly turning out to be. 18 months ago, Maguire could barely make headlines but after a stellar performance at the just concluded World Cup, he continues to prove as to why he is one of the most sought after defenders in the world. At the weekend, he was solid as ever and also had time to score the winner in injury time as Leicester defeated Southampton 2-1. 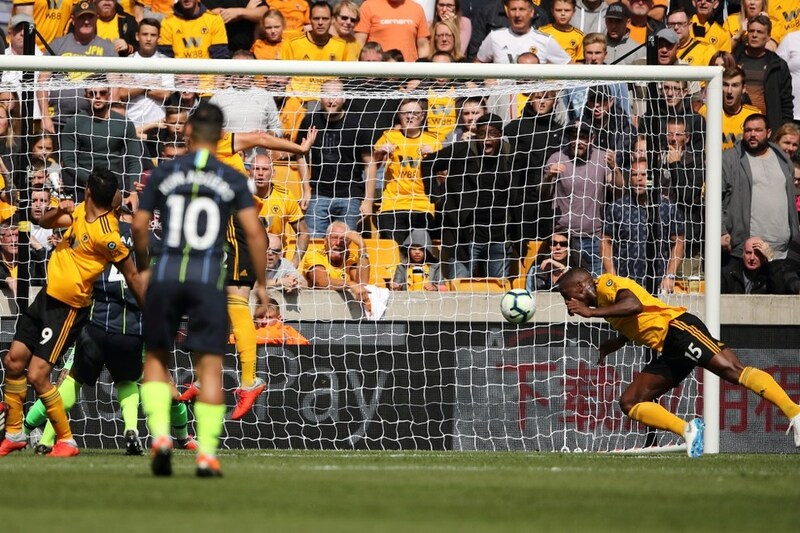 Not only did Willy Boly open the scoring against the current Premier League champions, he also made five clearances and two blocks as Wolves became the first side to take points off the Citizens. With the array of attacking talent that City has, the Frenchman was not fazed as he kept on tussling with their forwards all day long and winning most of his duels. His magnificently struck goal against Leicester was testimony to Bertrand is capable of. Few full-backs in the league can strike a ball as well as he does and despite the disappointment of not going to the just concluded World cup, the former Chelsea defender looks set to continue from where he left off last season. His goal last weekend was the first since scoring against his former side (Chelsea) in April 2017. MF. Jean Michel Seri (Fulham). Jean Michael Seri scored his first Fulham goal – it was the Ivorian midfielder’s first shot on target in the Premier League. After two stellar years at Nice, I thought he had the zeal to thrive at a bigger side but somehow ended up at Craven Cottage. With such performances, am sure its just a matter of time and he makes the big move. Yes Liverpool were not the side that we have come to appreciate of late but the ever-green James Milner did not disappoint as his side narrowly won 1-0 at home to Brighton. He may not be the ideal artistic midfielder that Liverpool fans would love to have but he is the sort of player Jurgen Klopp will sure be proud of. Milner completed 69 passes in the opposition half – more than any of his team-mates. Played like the European championship winner he is. Moutinho took charge of a midfield that had seasoned performers like Fernandinho and David Silva and barely put a foot wrong. If Wolves are to retain their Premier League status, he is the man to help them do exactly that. The penalty given by referee Paul Tierney was debatable but there is nothing debatable about the man who took the spot-kick, or his performance. Eden Hazard strolled through this game and was head and shoulders above everybody else on the pitch. Eden Hazard has now scored seven Premier League goals against Newcastle – the most against any other side in his career (level with West Brom). Walcott must surely be disappointed by his team mates as Everton threw away a 2-0 lead to draw 2-2 at AFC Bournemouth. At a time when the Toffees were down to 10 men, he was the go to guy and did not disappoint, scoring a goal and getting Adam Smith sent off but somehow his sides didn’t hold on to all three points. Mitrovic has scored 15 league goals since his debut for the Cottagers in February – no player has more in the top four tiers of English football in that time (Mo Salah has also scored 15). Against Burnely on Sunday afternoon, he scored two and was involved in the other as Fulham won 4-2. He has now scored three goals this season.